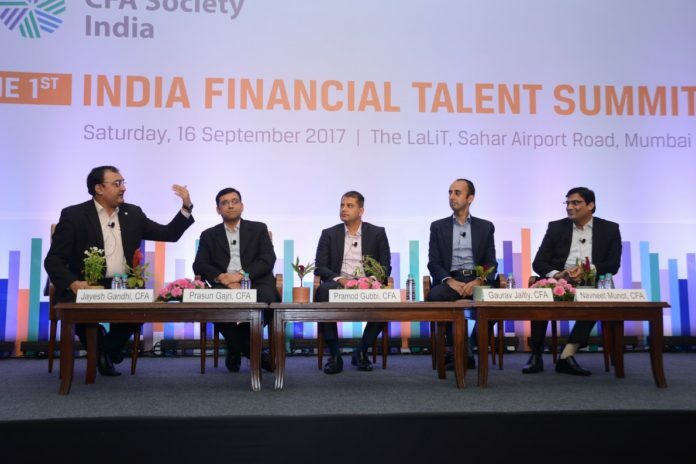 Bangalore: CFA Society India, in collaboration with CFA Institute, the global association of investment professionals, hosted the 1st India Financial Talent Summit, in Mumbai. The Summit was attended by nearly 320 investment management professionals, including CFA® charterholders and CFA® Program candidates. “With more domestic savings going towards financial products, almost all the sub-sectors of investment and finance industry are witnessing growth in business and recruitment. With this first-of-its-kind Summit, our aim is to bring together senior industry professionals and recruitment consultants to provide charterholders and candidates a comprehensive perspective on careers in the finance and investment industry,” explained Jayesh Gandhi, CFA, president, CFA Society India (volunteer) and senior portfolio manager, Birla Sun Life Asset Management Company Limited. Senior investment management professionals participated in the day-long Summit, including Chandru Badrinarayan, ED and Head, Client Coverage, South Asia, MSCI; Manish Chourasia, Chief Executive Officer, Tata Cleantech Capital Ltd.; Prasun Gajri, CFA, Chief Investment Officer, HDFC Standard Life Insurance Co. Ltd.; Rajeev Radhakrishnan, CFA, Head, Fixed Income, SBI Funds Management Pvt. Ltd.; Ravi Raman, MD and COO, InfraHedge Ltd.; and Shameek Ray, CFA, Head, Debt Capital Markets, ICICI Securities Primary Dealership Ltd.